Kurt Busch's Indy-Charlotte double will draw a lot of attention this weekend. I’m sure that most race fans by now know that Kurt Busch is doing double-duty on Sunday. 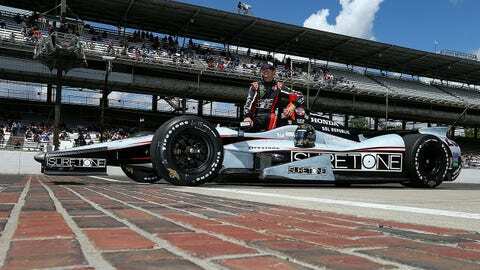 Not only is he racing in the legendary Indianapolis 500, then he’s jumping on a plane, and will be whisked to Charlotte in time to compete in NASCAR’s longest race of the year, the Coca-Cola 600. He is facing 1,100 miles of racing in one day. It’s quite an accomplishment, which only a handful of drivers has ever attempted. NASCAR has always been of the position and opinion that we have the greatest drivers in the world racing in our premier series. The fact that Kurt can cross-over to go from stock cars to IndyCars and then back to stock cars is a testament to that belief. I believe there will be race fans who will be watching the Indy 500 earlier on Sunday who will make it a point to tune into our NASCAR on FOX broadcast Sunday evening of the Coca Cola 600 just to see how Kurt does. Additionally there are folks that might go to either track because they could possibly witness history being made on Sunday. I am lucky to call Kurt my friend. Many people forget that at the end of my crew chief days before joining FOX Sports, that team owner Jack Roush had asked me to work with this raw rookie from Las Vegas by the name of Kurt Busch. So we’ve been friends for many a moon. I saw the excitement in Kurt quite a while ago when he first shared with me that there was even a possibility of this happening. Kurt is excited. He realizes how unique this opportunity is. He’s also been smart enough not to get so wrapped up in it that he doesn’t stop and savor ever moment of it. We as race fans are truly witnessing something rare. It’s a true testament to Kurt’s God-given ability behind the wheel to run both events. Kurt also understands clearly the responsibility he is shouldering by running both events, and he takes that responsibility seriously. Kurt wants not only both sanctioning bodies, both sets of competitors and the fans to respect him as a driver. He want’s to deliver a great performance worthy of the stature of both events. That’s a huge undertaking to accomplish. I’m so excited and proud of Kurt Busch. The thing I love about sports is the competition and we see it occasionally when miracles happen. There’s nothing saying Kurt can’t win the Indy 500 Sunday. He is with a very solid team so don’t automatically assume this is just some side-show act. There’s the real possibility that Kurt could fly back to Charlotte as the Indianapolis 500 champion and have a chance to win the Coca Cola 600 too. Just stop and think for a second how historic that would be plus the attention it would bring to both sports.